Maria, please email via the contact tab above. 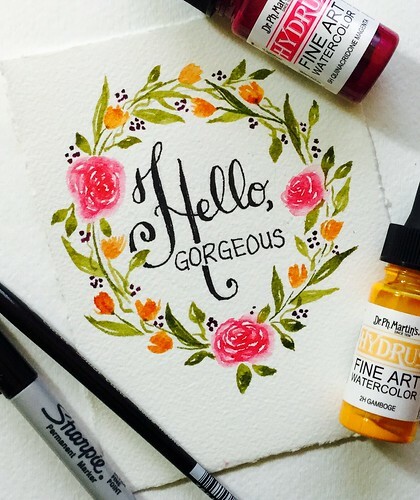 Enjoy your new watercolor painting adventure! If you didn't win and still are very interested in the class, you can CLICK HERE to get it at 50% off until Nov 18. Hello, friends! I know it's been a while since I blogged, but I continue to create and share my projects Instagram. Today, I have a special reason to revive this little blog of mine. 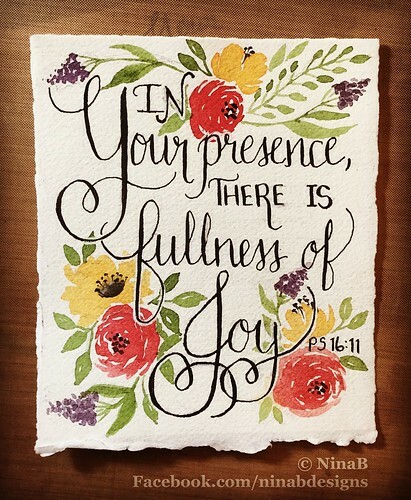 My fellow crafty friend, Angela Fehr, is also an extraordinary watercolor artist. She is launching a new watercolor online course, Creative Watercolor Techniques, that will be specially helpful to paper crafters like me and you. If you've followed me on this blog, my FB page and/or Instagram, you now how much I love watercoloring. So, I was more than excited when Angela asked me to participate in today's hop. Please bear with me as this is a long post, but I hope it'll be worth it to read to the end. I'm sharing lots of photos, info, tips, a huge discount code, a list of hoppers and a GIVEAWAY (leave a comment to win access to the course). Back in 2015 when I had to take a break from blogging due to a family health situation and temporary relocation, I had to make do with limited creative supplies. 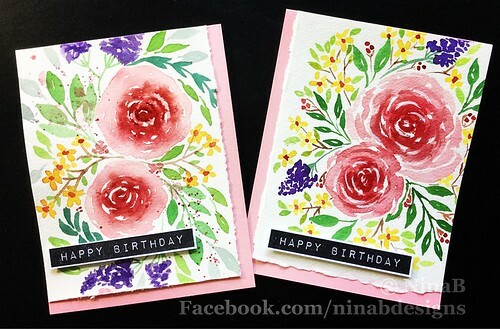 I had been dabbling with watercolors for my cards, but was limited in my supplies and skills. That Christmas, I received some fancy watercolor paints and papers. 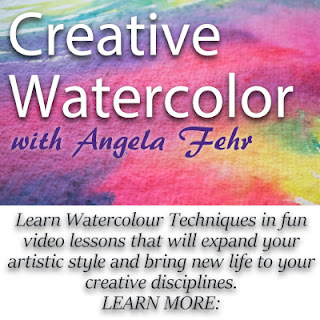 I then discovered Angela Fehr's Watercolor YouTube Channel and quickly enrolled in her online courses. 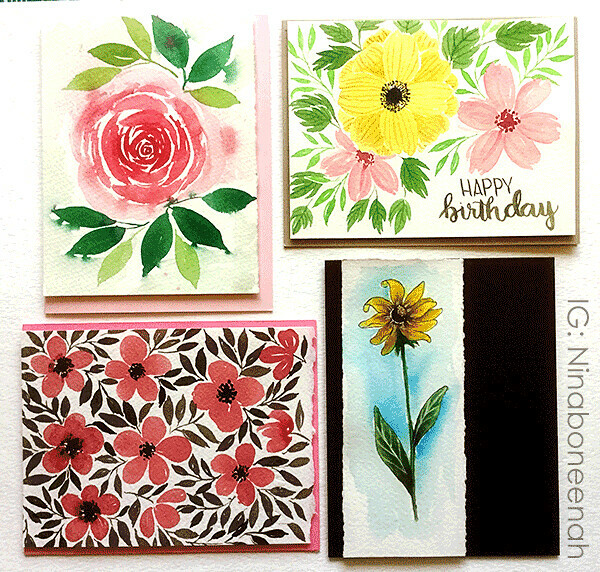 I've been slowly learning to combine my love for cardmaking and watercoloring by painting small pieces of art that I make into cards. You can see what I've been up to in that area through my Instagram account. is priced at $59 USD, however until November 18th, students can get the course for $29 (50% off) using the discount code FIRSTDIBS. If you win the giveaway after you already enrolled, you will be refunded the course amount. 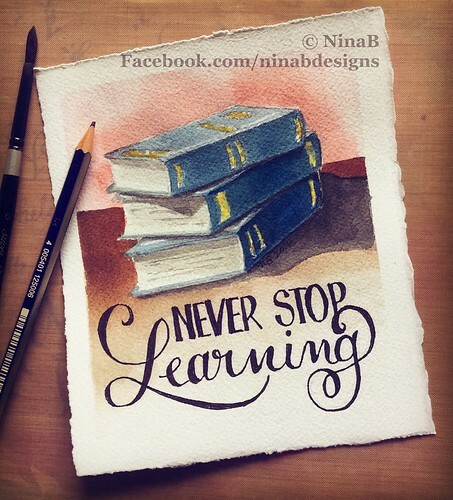 I consider myself an amateur watercolorer, but have learned so much in the last year about this art form by reading several books, watching videos, taking online classes and just doing art. The Creative Watercolourcourse touches subjects that I never encountered in my previous learning experience. Some new things that were new to me include products like Brusho paint and watercolor ground. New techniques to me include using transfer papers and watercoloring on canvas. The Creative Watercolour course will encourage the paper crafter to do more with the supplies they have on hand, and produce better projects. They can even begin the process of going beyond being just a hobbyist to a more serious watercolorist. Since this course has paper crafters in mind, I decided to use my crafter supplies, rather than my artist watercolor paints. 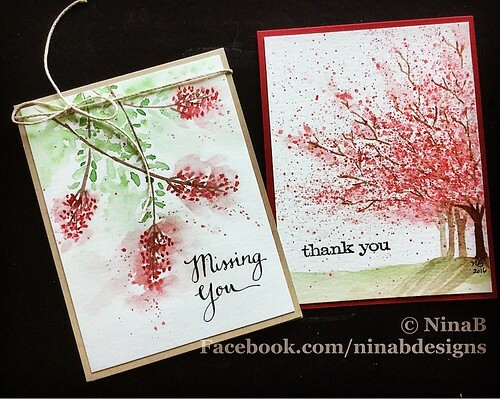 I used Ranger's Distress Inks for the first projects below. In this exercise, I want to show you the importance of good paper. I dabbed my Distress inks on my pallete as below. ***TIP: My pallette is a dollar store picture frame. The small indentation is perfect for Distress Inks watercoloring. I inserted a white cardstock to show the colors. 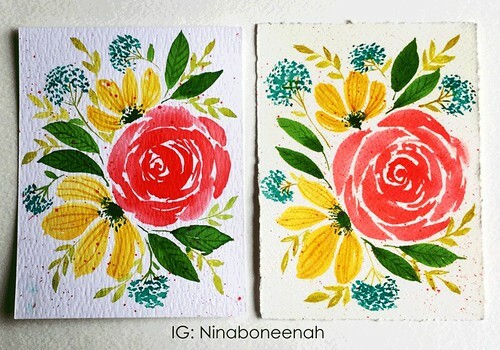 I painted two floral bouquets using the inks above, one on Tim Holtz watercolor paper (left), another on Arches 100% cotton watercolor paper (right). You can see the difference between the two. The colors just blend well together on the Arches paper. I wasn't that satisfied with the saturation level, so decided to use the Distress ink refills or Distress Ink Stains for the samples below. The photos didn't capture the colors well, but the results are way more vibrant and beautiful. Again, you can see, especially on the leaves, how much better the paints blend and shade on the Arches paper on the right over the Tim Holtz paper on the left. I have found after a year of casual painting, paper is the most important of the three items you need for watercoloring (paper, paint and brushes). You can work with cheap paints (even kids' paints, water-based markers, distress inks, etc) and cheap brushes (some professional artists I follow use them) and produce good art. But when you use cheap paper, I just found it harder to make the painting work and I ended up being frustrated. It makes a huge difference when you use good 100% cotton paper. I have used both Arches and Fabriano Artistico. ***TIP: An economical way to get the 100% cotton paper is by buying them in bulk and in large sheets (22" x 30") and cut them to card size. I get mine from Jerry's Artarama (around $43 for 10 large Arches and $35 for 10 Fabriano sheets). Large individual sheets of Arches can be purchased at Hobby Lobby and Michael's for around $5 with a coupon. One 22" x 30" sheet can be cut into 28 sheets of 4.25" x 5.5" card size. That ends up cheaper than the Tim Holtz paper that retails for around $5 - $6 for only 20 sheets. 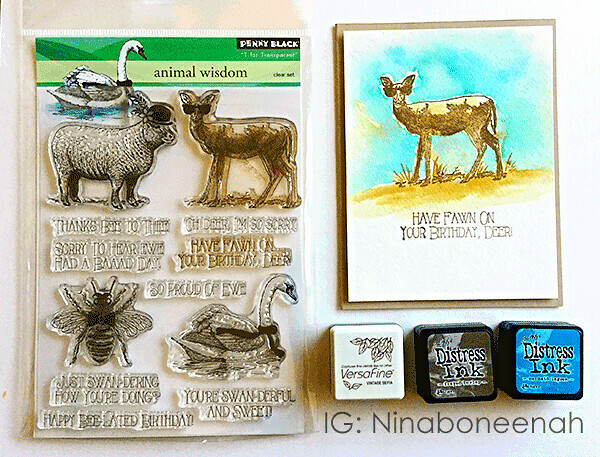 For my card below, I used a stamp set I designed for Penny Black called Animal Wisdom. I first stamped the image with the Versafine ink, then with the Distress Ink. The Versafine is not water soluble, so the stamped image line art stayed. I then colored the rest of the image with a waterbrush by moving the water-soluble Distress ink. For the background, I did the wet on wet technique using the blue Distress ink. ***TIP: In order to keep the line art intact, yet still achieve the watercolor look, stamp the image first with pigment ink (Versafine) then with the water-soluble ink. Here are a few more cards I created for the hop. The top left is the closest I can to copy Angela's style of free and loose. The top right includes calligraphy using watercolors. The bottom is ink and wash, also covered in the Creative Watercolour course. 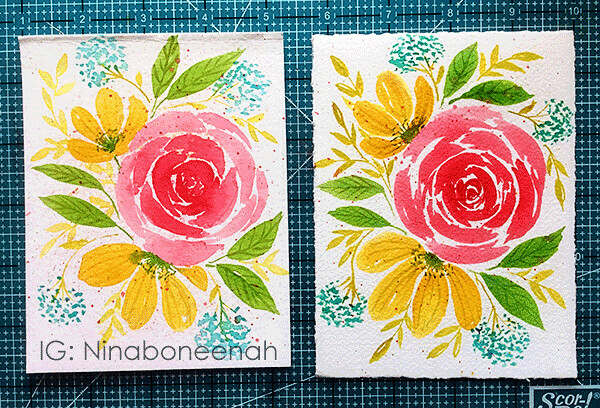 And finally, the one on the bottom left is just my attempt to create a pattern using leftover paint. 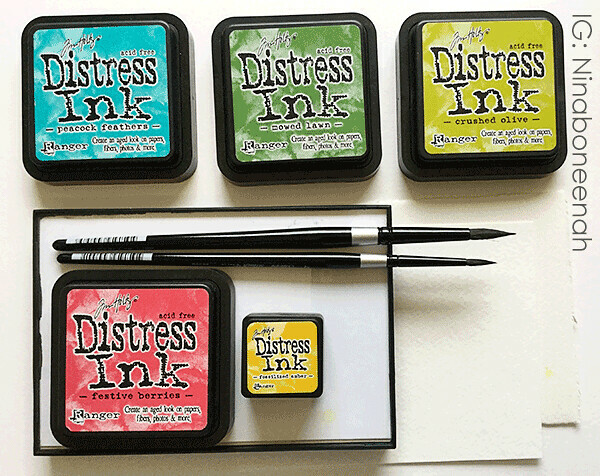 Finally, as I was cleaning up my desk, I happened to have more diluted Distress Ink leftover. 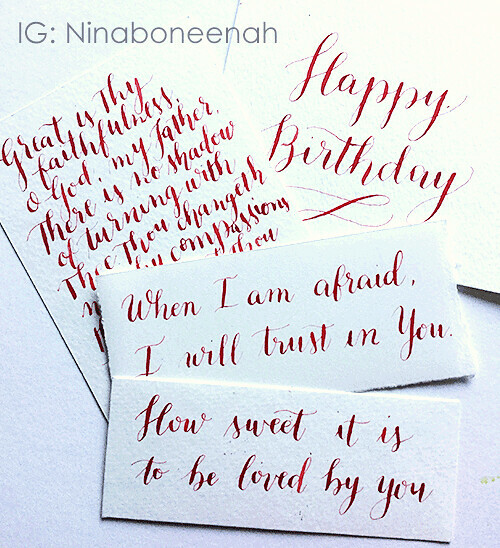 I used it to practice my hand lettering and calligraphy, using a dip pen. These can also be used to make cards! Please check out the rest of the hop participants below. 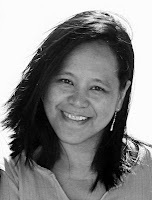 Nina Brackett's blog - you are here! I'm giving away a free access code to the Creative Watercolour: Techniques class. You can enter a maximum of two times for my giveaway. I will pick the winner by the end of launch week. First, leave a comment below. If you want another entry, please follow me on Instagram (where I am most active) and leave another comment below to say you've followed me there. If you're already an IG follower, please leave a comment below to say so. And don't forget, you can also go to the bottom link for Angela's grand prize that includes both the class and the kit. If you win the prize after you already enrolled, you will be refunded the course amount. Enter to win the grand prize here! Remember, Creative Watercolour: Techniques is priced at $59 USD, however until November 18th, students can get the course for $29 (50% off) using the discount code FIRSTDIBS. If you win the giveaway after you already enrolled, you will be refunded the course amount. I know it has been awhile since I've posted. Lots of things have happened in the last year, the biggest of which was I was away from my craft supplies. As a result, I couldn't create my usual cards. I did, however, become more interested in watercoloring because I received some supplies for Christmas. So, really I haven't stopped creating, just blogging. I have now started posting again, but not here on my blog. 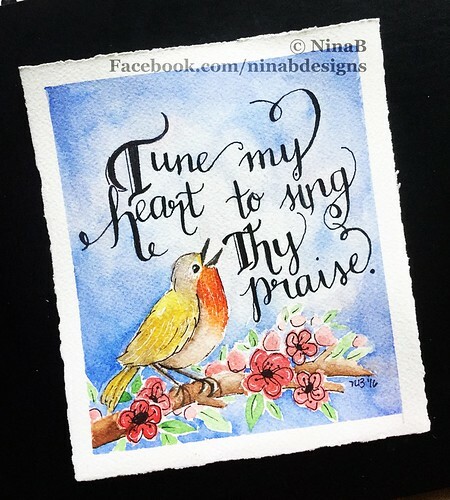 I am now on Instagram where I share my latest watercoloring and lettering projects, along with my usual cards. My Facebook Page is still there and I post whatever I have on Instagram there as well. I have found that posting there are easier to manage than here on my blog. I've had to relearn some aspects of blogger when posting this (I'm old! :) ). I have two cards for you today using some Unity stamps. I love that their stamps are huge and still the old-fashioned rubber on cling. The first one was stamped on watercolor paper and colored with Distress inks. The sentiment is by Penny Black. The wings and tag were highlighted with some fancy Want2Scrap bling. 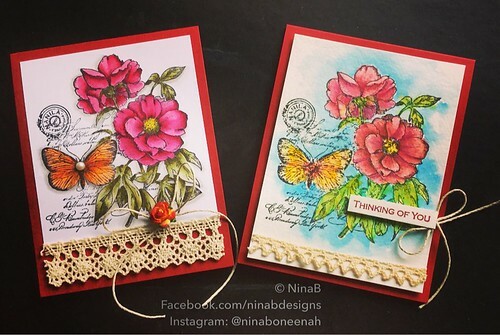 The card base, tag and lace are by Hobby Lobby. I hope you're not getting tired of the striped backgrounds. I bought a 50-card set at 50% off. You can't beat the price and the colors are lovely. The layout was inspired by the Unity Be Inspired Challenge and the colors by ColourQ. I'm also entering this to the SSS Wed challenge. 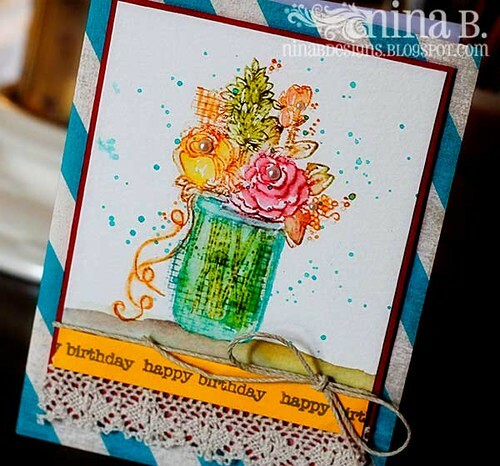 For my second card, I colored directly onto the stamp and spread the color around with water on the stamped image. I splattered some water colors to add interest. 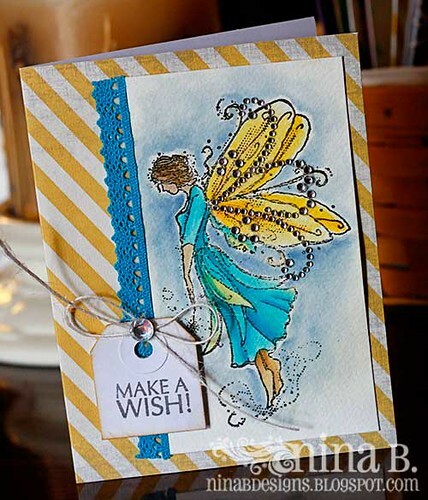 The sentiment is by Penny Black and bling by Want2Scrap. 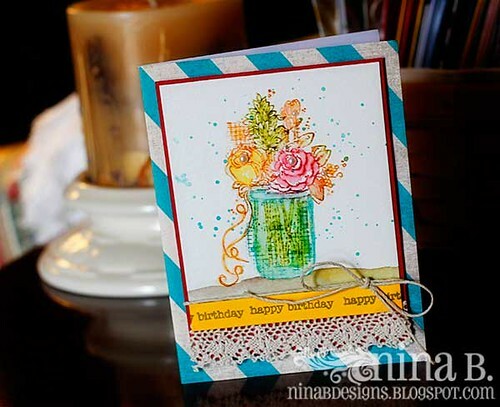 This card is inspired by the Color Throwdown, I'm also entering this to the SSS Wed challenge. This is it for me today. It's a scorcher here in the south. I hope you're enjoying fine weather where you are. Before I show today's cards, a few people asked about what I meant by wet on wet technique from a previous post. here's a Youtube video that shows you what it is and how to do it. I love it for coloring backgrounds. 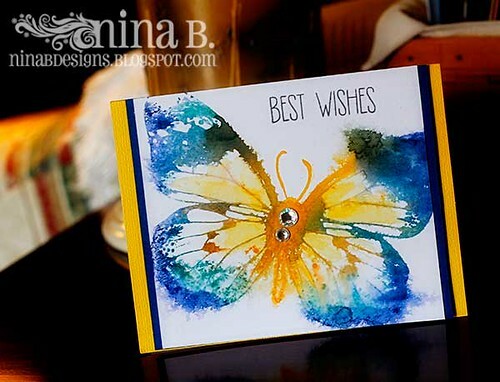 I have 2 CAS cards for you today using a big butterfly stamp by Indigo Blu. These were so quick and easy to make. 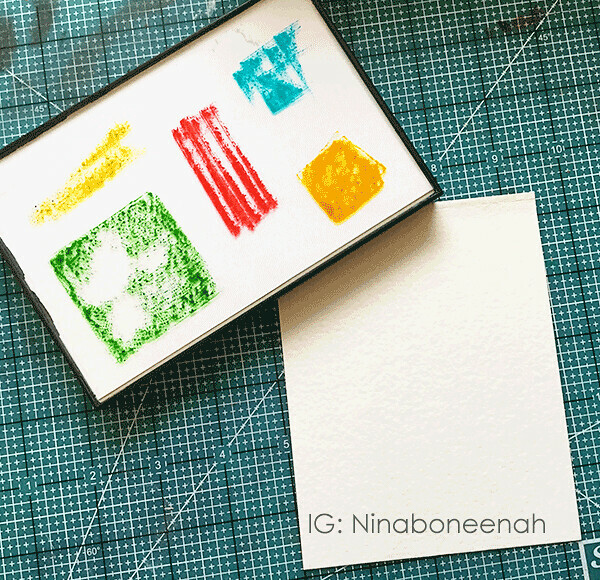 I applied Distress markers directly on the stamp before making an impression on the water color paper. For the first one, I added more watercolors on the stamped image and while it's wet, I loaded my brush with clean water and barely touched the wet color on the paper. This made the ink "bleed" as you see on my card. The sentiment from Tim Holtz Just Saying was heat embossed. The pearls are by Want2Scrap. 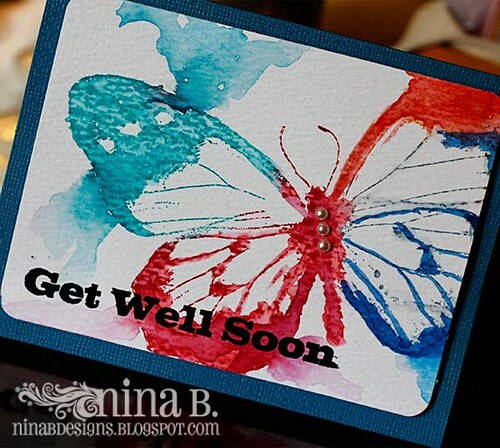 This card is inspired by the following challenges: Paper Players (colors), Fusion (inspiration photo), Our Creative Corner (smile), SSS Wednesday (favorite technique: watercoloring), Card Concept (Butterfly effect), Muse (inspiration), ATS Challenge (CAS). 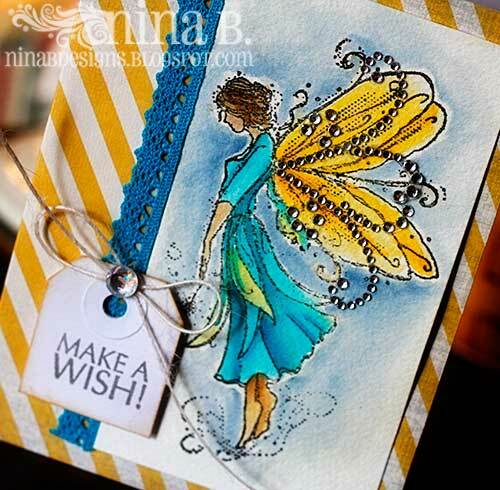 For my second card, I spritz water directly onto the stamped image. Because orange and blue are complementary colors, when they are mixed, they make a neutral color. In this case, a dark grayish brown. The sentiment is by Avery Elle. The rhinestones are by Want2Scrap. 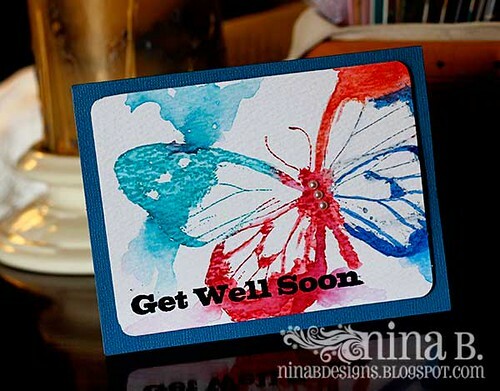 This card is inspired by the following challenges: Fusion (inspiration photo), Our Creative Corner (smile), SSS Wednesday (favorite technique: watercoloring), Card Concept (Butterfly effect), ATS Challenge (CAS).